Watch this space. I'm going to be commenting on at least several of his list of "sins." The pictures of the British 20th Armoured Brigade playing last post and lowering the Union Jack and brigade flag in Basra today naturally evoke earlier scenes of the retreat of Empire. (Do watch the BBC video if you can, though when I first did I had to watch some English ladies discussing detergent before I could see the transfer of command. Perhaps you'll get a more appropriate commercial.) Given Britain's history in Iraq in the 1920s and again in 1941, their presence there always had associations that ours would not evoke. Iraqis are very conscious of Britain's history in Iraq, though I think many Americans were oblivious. The UK has now ended all combat operations in Iraq. Did they Beat the drum slowly, did they play the pipes lowly? I think the British role in Iraq was always unpopular at home, and given Britain's history in Iraq, provocative in Basra, but that doesn't change the fact that once again the (increasingly thinner) red line fought well (and you have to look hard to find the red flashes on a British uniform today), occupied pretty humanely, and lowered the flag with the Last Post, to go back home again. May they never need to return. And may we follow as soon as possible. Funny that Nineveh is in Iraq and Tyre in Lebanon. It's time to play Last Post for Empire, I think. And Taps too. Remember Binyamin Ben-Eliezer? He actually was head of the Israeli Labor Party for a while in 2001-2002, between Ehud Barak and Amram Mitzna (another good trivia question in his own right). Ben-Eliezer has served as Defense Minister, and is currently the Minister of Industry, Trade and Labor. He was born in Baghdad, speaks fluent Arabic and is usually known in Israeli political circles by the Arabic name "Fuad." He's never had much of a profile among American commentators, in part I suspect because most Mizrahi ("Oriental") Israelis seem a bit alien to American Jews, but he's still a force in the Labor Party. "Netanyahu is going to surprise us all," said Ben-Eliezer, who is industry, trade and employment minister, after several tete-a-tetes with the prime minister over the past month. Regarding the Palestinians, Netanyahu's plan will be based on a two-state solution, said Ben-Eliezer. "It's not the same Bibi," Ben-Eliezer said. "He's much more open, patient and relaxed. He's not alarmed or dogmatic. Something happened to him. He realizes that he cannot afford another crash like the one in his previous term. "He understands that there's a new administration in the United States, which is neither the Clinton Administration nor the Bush administration, and that if we don't come up with a peace plan, someone else will call the shots for us." "If we find that Bibi lied to us, we'll quit [the coalition]," said Ben-Eliezer, who is a member of the security cabinet. I have no idea if he's right, but let's hope he is. Go ahead, "not the same Bibi," and "surprise us all." UPDATED: The Day Pigs were Slain in Egypt. There is resistance in pig farms north of Cairo to the decision to kill all the pigs in Egypt. Some pig farmers apparently object to eliminating their entire livelihood, especially since a) swine flu isn't currently spread by pigs, and 2) there hasn't been a case of swine flu in Egypt yet. I think what we're seeing here has only a tangential relationship to the swine flu near-pandemic. Both Islam and Judaism have, of course, a profound religious taboo against pork. All the pigs in Egypt are raised by Copts, and they do a pretty good job of keeping their pigs away from places where Muslims might come into contact. Pork butchers have to be separate from other butchers, and clearly labeled; they are for obvious reasons in Christian neighborhoods. I remember once going to a pork butcher in Cairo: not only were there plenty of signs to make clear to any Muslim who might venture there that this was not the place he was looking for, but the butcher had up photos and paintings of pigs and an extremely large collection of piggy banks, ceramic, pigs, etc., enough to make your average North Carolina barbecue joint proud. No desire, in other words, to have a Muslim wander in by mistake and be scandalized. Most of us who have lived in Muslim countries have probably also encountered the phenomenon of Muslim friends invited to lunch or dinner seeking reassurance that we are not serving pork. The fact that it takes a real effort to find pork in Muslim countries and that no one other than a seriously disturbed person would try to sneak pork into the diet of someone for whom it is taboo doesn't seem to compute: there seems to be, among some folks, a fear that Christians will try to sneak pork to Muslims. This must be something inculcated in childhood; I can't actually imagine anyone but a really disturbed person trying to force someone to eat pork unknowingly. There are plenty of theories about the Jewish/Muslim pork taboo; anthropologists often argue that it is a sign of the ancient rivalry between the desert and the sown: the pig is an animal of settled culture, raised in towns, wallowing in its wallow: no one drives great herds of pigs across the desert. Cattle are raised by nomads, and camels, sheep, and goats, but never pigs. (I believe Sumerians raised pigs but the Akkadians banned them: again the urban/nomadic origins influenced the taboo.) Some modern rationalists think it was a means of protecting people against trichinosis and other diseases of pork in hot climates, making Moses into a sort of Bronze Age Surgeon General. For believers, of course, the word of God is sufficient explanation of the taboo. And it is a profound aversion. I have known Muslims who insist they do not believe very much in God or practice their faith, wouldn't think of fasting in Ramadan and drink like fish, but who nonetheless admit they would be physically ill if they were confronted with eating pork. The culture sometimes goes much deeper than the faith. And of course that is true for all of us, not just Muslims. Many countries that are nearly entirely Muslim ban pork entirely, but I've also seen at least one breakfast buffet in Abu Dhabi where an entire table was set aside for foreign visitors with the word "Pork" in Arabic quite clearly displayed. The foreigners would just see bacon or ham, the locals would immediately be warned away. Israel has always had a limited pork culture for the secular side of the country, always clearly distinguished, and usually not in Jerusalem. Christian towns, in Israel or the Palestinian Authority, serve pork, and a great many years ago in the West Bank Christian town of Beit Sahour (just down the hill from Bethlehem) I was taken to a place known for its bacon cheeseburgers, which offends Muslims with the bacon and Jews not only with the bacon but with mixing meat and dairy. A truly transgressive place, and I suspect with the growth of Islamist fervor and the coming of the Palestinian Authority, it's not there anymore. Except for such deliberately rebellious or transgressive situations, though, there's just not that much pork in the Middle East. Since no Muslim will go near a pig, alive or slaughtered, I have no idea how the Egyptians think swine flu could be transmitted to the general population. I suspect we are seeing an instance, perhaps subconscious, of the profound cultural taboo against pigs. As I noted in an earlier post, Egypt has had several years of bird flu outbreaks, but hasn't tried to kill all the birds. Some things are predictable: the fact that the pig farmers whose pigs are being destroyed are Copts will mean there will be new charges of religious persecution against the Copts; radical Islamists may use the whole thing as a reminder that pigs are a Christian presence in Egypt and therefore somehow subversive in their own right; and other rabble-rousing accusations. Lebanon has banned pork imports and Jordan is talking about limiting pig farms; and yet there seems to be no evidence that pigs are a major disease vector in this outbreak! The term "swine flu" refers to the source from which the original strain of human flu of this category originated and does not mean that pigs are causing it today. I really don't know why the Egyptians are doing this, except for pure domestic consumption. But it is a reminder of how profound at least some food taboos can be. The four Lebanese generals who have been held since 2005 in connection with the Rafiq Hariri assassination have now been freed thanks to a decision by the Special Tribunal for Lebanon meeting in the Netherlands. The result is likely to have a major impact on the June elections, as well as to further muddy the waters of a case that has everything but a Grassy Knoll. The four are former General Security Services Director Maj. Gen. Jamil al-Sayyed, former Internal Security Forces director Gen. ‘Ali al-Hajj, former Military Intelligence head Brig. Gen. Raymond Azar, and former Presidential Guard head Brig. Gen. Mustafa Hamdan. All four generals had close links to Syria and there were allegations they had links to the Hariri assassination, but the prosecutors in the case (not the defense, the prosecution) told the Tribunal that there was insufficient evidence to charge the men. The Tribunal then ordered their release. They had been held by Lebanese authorities in Beirut. Addressing a cheering crowd at his home, General Sayyed denounced the four year detention without charge and explicitly thanked Hizbullah Secretary-General Hasan Nasrallah for his support and advocacy of their release. Though many had anticipated that the Tribunal would lack the evidence to charge the generals, this is a political bombshell, coming as it does in the runup to the June 7 Parliamentary elections. Sa‘d Hariri, Rafiq Hariri's son, heads the Future Movement which is at the core of the current government majority. The opposition, especially Hizbullah, has supported freeing the generals. Today was another unforgettable day for half of the Lebanese people, four families and fading project. The pictures of the four Generals were raised again, but this time not as the “Cedars Revolution” wanted to portray them, but as free men. The four Generals are free and their freedom was the last nail in the coffin of the most complicated and politicized era that was intended to establish theories of how to rule based on monopolization for personal ends. Three years, seven months and twenty nine days; a long time during which some have exploited the slogans of security and judiciary to distort fixed national standards and divert them to fit the so called “New hybrid Middle East” and canned democracy. Today, the 29th of April, 2009 was catastrophic for the conspirators who had sought to raise the slogan of short-of-evidence vengeance. Back in 2005, in the heady days of the "Cedar Revolution" and Syria's withdrawal of its troops from Lebanon, the arrests of the generals was seen as part of a genuine democracy movement and a triumph for democracy and a defeat for Syria. But there was no follow-through. One key witness reportedly recanted, and charges were never lodged against the generals. In 2006 Hizbullah strengthened itself politically by absorbing and rebounding from a direct Israeli assault; and by this year the long detention of the generals without a charge had turned the case from a democratic victory to a virtual human rights abuse. There are a great many things about the Hariri case that suggest high-level involvement on the part of the security services. That was the conclusion of the Mehlis Report back in October 2005. And the prosecutors in the Netherlands made clear that if sufficient evidence emerges in the Tribunal, the generals could be re-arrested. The key witness who recanted his testimony may have been coerced into the recantation and another key witness died in a car wreck (possibly an accident, but there are skeptics). The evidence has been so compromised at this point that it remains to be seen what the UN Tribunal can do. It consists of international and Lebanese jurists and is meeting in Leidschendam near the Hague. Sorry, the quote was just too good not to put in the headline. I noted when the Algerian Presidential election occurred that its most interesting result was not that Bouteflika won (or the sun came up in the East that day), but that a woman for the first time ran in second place in an Arab Presidential election. Now The Moor Next Door, who blogs mostly about Algeria and keeps me honest by commenting frequently here as well, has a very good post on Louisa Hanoune, the Trotskyite woman Algerian Presidential candidate (five words that probably won't Google up any other names than hers) who ran second to Bouteflika. According to his post, in one Algerian village a graffito was seen saying, “The atheist woman before a gnome dictator.” (Bouteflika is short.) That's the source of the headline above. I mean no offense to President Bouteflika in quoting the line, but it's really quite revealing. My favorite line in this report just cited: "Helwan province has decided to "temporary" execute the pigs till the disease is combated." I know, the English isn't great, but the Arabic says the same thing, basically. Temporary execution is a novel concept. I wonder how they do it. I'm guessing it's a temporary measure, and not at all temporary from the pigs' point of view. 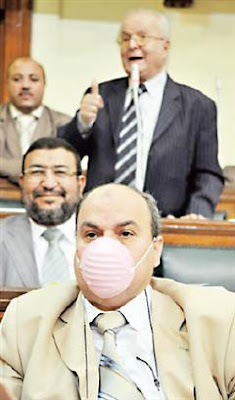 The photo accompanying the story (left) shows a member of the People's Assembly wearing a surgical mask in Parliament. I suspect Egyptians will write their own jokes on that one, and they'll probably be better than what I could come up with. An additional thought: Egypt has had several outbreaks of bird flu in recent years, but I don't recall a campaign to kill all the birds in the country. Despite all this publicity in Egypt, so far as I have heard, the only country in the Middle East with confirmed cases so far is Israel, casting a bit of a pall over their 61st Independence Day celebrations. An interesting piece in yesterday's Financial Times on Google's attempts to increase Internet and web penetration in Arabic (requires a free registration to read) has set me off on a range of musings on the Arabic language and the issue known as diglossia. When it comes to the internet, the Arab world punches well below its weight. Less than 1 per cent of the internet’s content is in Arabic, while the world’s approximately 370m Arabs form more than 5 per cent of the global population. Internet usage has jumped 1,000 per cent over the past seven years in the Middle East, yet it still lags well behind other regions. Overall internet penetration has reached 10 to 12 per cent, although with the region’s large number of shared connections, up to 50 per cent of the population is estimated to have access to the net. This is great stuff. Back in the 1970s, I typed my doctoral dissertation on a manual typewriter and had to write the Arabic text by hand, though later I acquired an East German Arabic typewriter cheap. (Good thing I don't need it anymore as I imagine finding East German ribbons is hard these days.) You young whippersnappers have so many cool tools available today . . . why when I was a boy . . . Although most Google applications, plus Facebook and other media now have Arabic language front-ends that allow people to blog, e-mail, etc. in Arabic, there are still many challenges to fuller Internet penetration. One is the simple one of illiteracy in the Arab world, which is still high by global standards, especially among women. Another is the problem the linguists call "diglossia": the fact that Modern Standard Arabic, the language of newspapers, university instruction, public speeches, etc., is actually no one's first language; Arabs grow up speaking their own local dialect (usually referred to as ‘amiyya or lahja in the East and darija in the Maghreb), which they learn at their mother's knee. They don't just have to learn to read the language they already speak: they have to learn a related but more complex and formal language that no one speaks today, or may ever have spoken as such. It's a deterrent not only to literacy but to entering the public sphere as a journalist, politician, or academic expected to perform in Modern Standard Arabic. The Egyptian author and psychologist Mustapha Safouan, (writing in French to underscore the irony), has argued that diglossia contributes to why the Arabs are "not free," in that only the elites can handle the learned language of power. Here's an article about his work, and here's an excerpt; I haven't read his work other than what you see there. Here's a more scholarly treatment of the subject of diglossia. Which allows me to mention that MEI's Language department plans to hold a conference on diglossia this fall. I'll post more as the schedule firms up. I was fortunate to learn a spoken dialect (Egyptian) quite early on, and am an enthusiast for learning the language people actually speak to each other, though a serious student must also know the literary language, of course, and I also had to learn the classical/Qur'anic form, though I'm rusty in it now. When I know how to say something in the local dialect, I do so; when I don't, I'll use Egyptian first, before Modern Standard, because Egyptian films and TV, and Egyptian expatriate workers, mean most Arabs have heard Egyptian. I think everyone learning Arabic should learn both a spoken dialect and the literary language, but that view is not universal. There is an added problem here: it's often hard for Westerners to learn a specific dialect because the Arabic teachers often disdain teaching them: I've had Egyptians tell me that Egyptian dialect is not Arabic, it's just "slang." If so then most people speak "slang" at their mother's knee. If you speak only Modern Standard you're going to have trouble conversing with taxi drivers, doormen, and others who may not be the most literate. And I have a "flipside" anecdote as well: while many Egyptians are startled when an American or other Westerner uses colloquial instead of Modern Standard to them, and they disdain (officially, while speaking it) the dialect, I once took a newly-arrived scholar in Egypt out for a drink. The waiter, a galabiyya-clad baladi sort who looked remarkably like the mummy of Ramses II, knew me well, and I introduced him to the newcomer, a Ph.D. who hadn't spent much real time in the region. I told the waiter, "my friend can read Arabic but doesn't speak it." The response from the waiter, who probably had the reverse problem, was mish ma‘'ul ("unbelievable": itself colloquial: ma‘'ul is Classical ma‘qul), since to him the literary language was a mystery but the spoken language a necessity of daily life. For non-Arabist readers, it's hard to explain how much the "dialects" differ, but it can be as much as between Romance languages (and I don't mean Spanish and Catalan here; I mean Spanish and French.) But let me try to offer some examples. I remember many years ago standing in line at a newspaper kiosk somewhere in Morocco. A Saudi — or other Gulf Arab in full Gulf regalia — was ahead of me in line. He asked the Moroccan how much something was, and the Moroccan replied "kham-SIH," to which the Saudi responded "Khamsin?" ("Five," and "fifty," respectively. The Saudi would say "five" as KHAM-sa.) Since even Arabs can't always understand each other's dialect, it's hardly surprising diglossia is a problem for them and for foreigners learning the language. (Morocco and Algeria long have been wrestling with a different problem: the generation who grew up under French colonial rule spoke only the local dialect and a bit of French: only the post-colonial generation grew up with a capacity for Modern Standard. Time and age are slowly eliminating this problem.) [UPDATE: Check out the first comment below, from the Algerian Blogger The Moor Next Door, on the contemporary Algerian situation]. Consider something so simple as asking, "How are you?" In Modern Standard Arabic, which no one would ever actually use except in an international meeting or a language course, it would be Kayfu haluka? An Egyptian will say, izzayak? ; a Lebanese Kifak? or Kifak inta? or Kif Halak? ; an Iraqi may ask Shlonak? and a Moroccan La Bas? (Forms will differ if addressing a female or a group: these are singular male forms.) The answer could be kwayyis, zayn, mnih, tayyib (that one is cognate with Hebrew tov), or in Morocco, La Bas again, not to mention lots of other possibilities. Practically every dialect has a different way of saying "what do you want?" as well, and even such a seemingly essential word as "now" can vary from dilwaqti to hala to the classical al-an. The differences are actually greater for the simplest greetings and daily conversation; when one is talking about computers or political economy, the literary language naturally gives a certain unity, but when one is talking about ordering a meal, the words may differ. Even so basic a vocabulary word as bread (khubz versus ‘aysh) or milk (halib or laban, with the added complication that in halib countries laban means yogurt) varies. "Isn't it so?" that essential question that French handles with n'est-çe pas?, Spanish with ¿Verdad?, German with Nicht Wahr?, and American English with "idnit?," would be a laysa ka-dhalika? in Classical Arabic, but mush kida? in Egyptian, mush hayk? or mu hayk? in Levantine, and so on. In the Levant and elsewhere, the cities' dialects are similar to each other, but the rural and bedouin dialects are quite different. Someone from ‘Amman and someone from Damascus will sound pretty similar, but a tribesman in a black tent in between them will speak something quite distinct. I imagine this subject will come up again. It's one that some Arab scholars (such as Safouan cited above) are becoming more cognizant of. It isn't limited to Arabic — diglossia is also a problem for Greeks, Chinese, and a number of other peoples — but it's one that isn't usually well appreciated by Westerners who don't know Arabic, in part because Arabs themselves don't talk about it that much. The attacks on the shrine of Al-Qazimiyya in Baghdad on Friday and on other Shi‘ite targets on Thursday and Friday threaten a renewal of sectarian conflict, as I noted at the time, but also spur me to talk a little about the role of Shi‘ism in Iraq, which is often misunderstood. The last one may be a bit unfair, and the second needs to be qualified, as it is above, to note that Sunnis from countries such as Iraq, Lebanon, Bahrain or Kuwait usually have a more sophisticated understanding of Shi‘ism. But this is not just a rhetorical point: Shi‘ites in largely Sunni countries are sometimes portrayed as a pro-Iranian fifth column because of this misperception. Shi‘ism was, in its origins, as Arab as Sunnism. It was born in Medina, nurtured in Kufa and had its great martyrdom on the field of Karbala'. Of the 12 Imams of Twelver Shi‘ism, only one, ‘Ali al-Rida (‘Ali Reza), the eighth Imam, is buried in Iran (at Mashhad). The twelfth Imam disappeared in Iraq, and the other ten Imams are buried in Saudi Arabia or Iraq: ‘Ali, the central figure of Shi‘ism, is buried in Najaf, Iraq; Hasan, the second Imam, is buried in Medina; Husayn, the third, is buried where he fell at Karbala' in Iraq; the fourth, ‘Ali Zayn al-‘Abidin, is buried in Medina, while the fifth and sixth are also buried in Medina; the seventh and ninth are buried at the Qazimiyya shrine attacked last Friday in Baghdad; the tenth and eleventh are buried in the al-‘Askari shrine in Samarra' (blown up in 2006, starting a wave of sectarian killing); the twelfth disappeared in Samarra' as well. The reason there were so many Iranian pilgrims killed in the attacks in Iraq (leading Iran to blame them on the US and Israel, though clearly Sunni radicals were responsible) is that most of the major shrine mosques of Shi‘ism are in Iraq, final resting place for six of the twelve Imams. Until Saddam Hussein began really cracking down on the Shi‘ite clerical establishment during the Iran-Iraq war (again, the suspicion of Shi‘ites as a fifth column), Najaf was the most important scholarly center for Shi‘ite theology; it was where the Ayatollah Khomeni himself taught in exile from Iran. With the Iranian Revolution and Saddam's crackdowns, the importance of Najaf declined and Qom, Mashhad, and other Iranian clerical schools became suppliers of clerics to Shi‘ites in other countries; with that came some genuine Iranian influence (such as with Hizbullah in Lebanon), but most Arab Shi‘ites are Arabic-speakers, not Persian-speakers. As I said though, many Sunnis assume Arab Shi‘ites are somehow more Persian than they are, and many Iranians are surprised when Arab Shi‘ites do not avidly follow the Iranian model of clerical rule. Iraqi Shi‘ites rightly and proudly consider their country the seedbed of Shi‘ite Islam. Loose Fruit: Tehran's "Citrus Plot"
Over the weekend, Iran was in a bit of an uproar over the apparent sale of Israeli citrus in Tehran; the fruit, an orange-grapefruit hybrid, had the Jaffa stickers on them, and this led to public controversy, and the use of the term "citrus plot" by Iranian officials who claimed it was unofficial and that those responsible should be arrested. The BBC reports, however, that the fruit was actually imported into Iran from China, and is not actually of Israeli origin. So false-flagged fruit may be involved. Israelis seem to be following this with some amusement. Also another version here. Assuming what most reports now seem to be assuming, that this is Chinese fruit masquerading as Israeli with counterfeit Jaffa stickers, it would suggest that someone in China doesn't know very much about Middle Eastern politics. A Jaffa sticker may be a sign of quality in Europe or Asia, but it's going to be noticed in Tehran. Although I'm pretty sure in the present political climate this is exactly what it appears to be, I was reminded of being told by Israelis, back during the Iran-contra scandal, that they first began to suspect the three-way US-Iran-Israel connection in the secret arrangements when very high-quality pistachios showed up in abundance in Israeli markets. Egypt's Agriculture Ministry wants to ban the transport of pigs, and the Environment Ministry wants to move all the pig farms. (Pigs are raised in Egypt by and for the Coptic population; pork is sold only through pork-specific butchers, as far as I know.) The Arabist notes that some Egyptian talk shows have discussed killing all the pigs. Lebanon has banned the import of pork. In Israel, which has two people under observation for possible but unconfirmed infection, the Deputy Agriculture Minister, Yakov Litzman, a haredi or Ultra-Orthodox Jew from the United Torah Judaism faction, has said that Israel will refer to the disease as "Mexico flu," since swine is forbidden. I've already mentioned the recent coming apart of the Syrian exiled opposition. Josh Landis at Syria Comment — the blog for Syrian issues — posts a couple of articles (one of them in Arabic) that go into the nitty-gritty details. Highly recommended. Natan Sharansky will be the new head of the Jewish Agency. Heroic as he was when he was being held by the Soviets, since coming to Israel he has been pretty hardline at times. Putting him in charge of a major fundraising agency would seem ill-advised, almost like making somebody like Avigdor Lieberman your chief diplomat. Oh, wait . . . Speaking of Lieberman, this interview isn't very cheering. He tells the Jerusalem Post that he's been meeting with all these foreign representatives (he's Foreign Minister, isn't that his job?) and (he seems shocked, shocked) they keep using all these slogans about "land for peace" and a "two-state solution." Umm, yes, those "slogans" do seem pretty widespread among just about everybody, including a lot of Israelis, and there is that "roadmap" we keep talking about that speaks of both. The real issue, he seems to suggest, is Iran. So why is everybody talking about land for peace? (But if Israel had peace with Syria and the Palestinians, how would Iran be able to retain a foothold in the Levant? Wouldn't a Syrian peace undermine Hizbullah and Hamas? Oh, sorry, I guess that's a slogan. Must avoid those.) The whole interview will appear Tuesday, apparently. Pardon me if I keep thinking that somewhere out there, the late Abba Eban is picking up RPM speed as he rolls over in his grave. The Moor Next Door gives us a brief update on events in Mauritania, where the current military strongman recently "stepped down" (not really) so he can run for President. Since very few of us have any experience of Mauritania, and with the exception of Brother Leader Qadhafi (who is on a Mauritania kick lately as a "mediator" between factions) and, occasionally, the Moroccans and Algerians, nobody in the Arab world pays much attention to this Arab country either, it's useful to have these updates. I recall a good many years ago being at a reception for Arab military attachés and chatting up the Mauritanian military attaché because the poor fellow, a colonel I think, was standing all alone. None of his Arab brethren were talking to him. Or seemed to know who he was. I mentioned earlier (in last Friday's roundup, in fact) that Lebanon was dealing with a sensational Israeli spy case involving a General of the security services who had been identified only as "General Adib" by his first name: now he's been indicted and fully identified, and his wife and nephew are also charged. Walid Jumblatt, the Druze za‘im of Mount Lebanon (and I've always contended the best translation of za‘im is "Godfather" in the Corleone sense, but that's another issue: officially it means "leader" or maybe "boss") has alienated his Maronite allies of the moment by saying something bad about the Maronites in a discussion with Druze elders. He has apologized. I had to read about five different sites trying to find out what he was apologizing for, since it's generally been reported as one of those "I misspoke, I apologize" stories that never say what he actually said. This is the only thing I've found yet, in the Daily Star, that (while burying the lede) suggests he called the Maronites a "bad race." I need to find the Arabic for this since I'm still unclear what he actually said. I thought they were a religion. The wave of bombings over the last two days has now hit the holiest Shi‘ite site in Baghdad, the shrine of al-Qazimiyya (also called Al-Qazimayn), the shrine of two of the 12 Imams of Shi‘ism. On top of yesterday's bombings of several Shi‘ite neighborhoods, it's been a grim week and a reversal of the generally improving security situaiton of the past year. Since this has been a clearly sectarian series of attacks, the assumption is that we are seeing a new vigor in Al-Qa‘ida in Iraq, possibly aimed at taking advantage of the recent decline of enthusiasm in the Sunni Awakening movement, and attempting to revive the bad old days of 2006, when the bombing of another Shi‘ite shrine, the al-‘Askari mosque in Samarra, provoked a sectarian civil war. The fact that many of those killed yesterday were Iranian pilgrims obviously also complicates the situation. There is of course the possibility — perhaps we should say the hope — that this will produce a popular backlash among Iraqis who have come to treasure the improved security situation, and not a renewed wave of sectarian vendettas. But it is a reminder that this story is not yet ended, however optimistic things may have seemed of late. At one point it looked like the Iranian Presidential field was going to splinter on the reformist side, until Mohammad Khatami pulled out, leaving two reformers (Mehdi Karrubi and Mir-Hossein Mousavi) in the race. On the harder-lining side, though, the field is now starting to splinter. Mahmoud Ahmadinejad's successor as Mayor of Tehran, Mohammad Baqer Qalibaf, is expected to run, and now a real hardliner, former Islamic Revolution Guards Corps (IRGC, Sepah-i-Pasdaran) commander Mohsen Reza‘i, now Secretary of the very powerful Expediency Council, is running as well. I'm not an Iran specialist, but given the fact that the IRGC is the most critical support constituency, by many accounts, of Ahmadinejad's rise to power, the decision of its former commander (from 1981 to 1997) to challenge him is interesting. Reza‘i has run for President before without much success, but he could really cut into some of Ahmadinejad's core constiutency, I suspect. Here's a report that historian Michael Oren is under consideration for Israel's Ambassador to Washington. As the article notes he has been critical of Obama in the past; Netanyahu is going to need someone skilled in DC given the differences between the US and his government at this time. Oren has no diplomatic background. The artticle also mentions other candidates, including two who've held the job under earlier Likud governments, Zalman Shoval and Dore Gold. It will be interesting to see if he can get someone in place before he visits in May. It's also interesting that the White House hosted King ‘Abdullah II of Jordan today, the first Arab leader to visit since Obama took office (and, interestingly, visiting ahead of the Israeli Prime Minister). Though, of course, Obama rather famously met the other King ‘Abdullah, of Saudi Arabia, in London at the G-20. A thoughtful discussion of an interesting question: Marc Lynch on whether we should support Internet activists in the Middle East, or whether encouraging them increases the risk to them. In the wake of the big fizzle in April 6, in which it was seen just how hard it may be to transform a Facebook group into a protest movement, it's an interesting question worthy of thought and discussion. The United Nations has issued its recommendations on the future of the Iraqi city of Kirkuk, one of the most difficult challenges facing the Iraqi government as it tries to build a peaceful future. The UN report has not been made public, and only its general outlines have been officially announced, but there is enough leakage for The New York Times to offer a general outline, and for commentary by veteran Iraq-watchers. It seems the report urges several possible futures, but comes down against partition (between Arabs and Kurds) and favors some sort of autonomous city-state or corpus separatum with power sharing among Arabs, Kurds, and the third ethnic group involved, Turkmens. Those kinds of solutions are easier said than done, easier to talk about than to realize. Kirkuk offers no easy solutions. It sits amid oilfields which make it a valuable prize; for decades the central government sought to Arabize the area, renaming the province "Ta'mim" (Nationalization) and moving Arabs in where Kurds and Turkmen had once predominated. The Kurds (and the Turkmen) have been seeking to reverse decades of demographic change, but as always happens in such cases that involves dispossession of people who have already lived there for years. Here's a backgrounder by Joost Hilterman of the International Crisis Group that introduces the issues. Any grand compromise that deprives the Kurds of the city but does not offset that with some sharing of the oil revenues is likely to provoke open conflict between the Kurdistan Regional Government and the central government. Of all the slowly simmering fuses threatening the future of Iraq, Kirkuk is perhaps the biggest powderkeg. For that reason it, rather like Jerusalem, has been deferred as too thorny to resolve right away; the province did not hold provincial elections earlier this year like other provinces. Juan Cole notes that he thinks partition would be a better solution. Certainly power sharing arrangements have a tendency to come apart when there's a great deal at stake. It will be interesting to learn more about the UN recommendations. Here's a piece in the Jerusalem Post about Nomi Stone, who was until last year Assistant Editor here at The Middle East Journal. Always good to see an alumnus/alumna getting well-deserved attention. In what looks, at least for now, like a major victory, Egypt's real estate tax collectors have formed an independent union, the first since 1957. It represents a break with the Egyptian Federation of Trade Unions, the (government approved and hence pro-government) umbrella for official unions. Egyptian opposition figures are celebrating what appears to be a breakthrough, though if you read the article carefully, while the Ministry of Manpower cannot "disapprove" the new union, the government has 30 days to challenge it in court. Whatever the fate of the new union, it may serve as a reminder that Egypt may be authoritarian, but it is not totalitarian: there have always been elements of genuine representation, if only at the margins, among some of the professional syndicates, some local government institutions, and the courts. That has eroded in recent years, but it is not, and never has been, the fearsome monolith that was Saddam Hussein's Iraq. Egypt Now Blaming Lebanese Officials: Is Egypt Now Overreaching, As Hizbullah Did? Egypt's propaganda drumbeat against Hizbullah for the cell supposedly plotting attacks in Egypt had already broadened to include denunciations of Iran and protests to the head of Iran's interest section in Egypt. In the last day or so, the net has widened to include allegations that Lebanese government officials were involved in the plot. Variants of the story appear here, here, and here. The "complicity" of Lebanese authorities seems to consist of issuing a passport in a false name to the head plotter. The way Egypt is handling this story is, I think, a reflection of the current deep divisions in the Arab world between the states we tend to label "moderate" (Egypt, Jordan, Saudi Arabia) and the states more closely aligned with Iran (Syria, Lebanon, sometimes Qatar). In quieter times these sorts of stories tend to be swept under the rug, but at the moment Egypt has chosen to use the story as a weapon to bash Iran and now, it appears, Lebanon. There may be some pitfalls in the continuing propaganda campaign, however. Hizbullah seems to have overreached by meddling in the internal affairs of another Arab state, and Egyptians of all political leanings have a natural inclination to reject external interference in Egypt, which evokes memories of European colonial rule. But two other elements are in play here that could ultimately backfire on the government, which may itself now be overreaching in its overreaction. The first is that Egyptians have a longstanding tendency to distrust government accounts of anything (if it's in the newspaper, it must not be true: trust what you hear at the coffeehouse instead), and despite some suspicions of Hizbullah's Shi‘ite identity and Iranian links, there is also a latent admiration of Hizbullah for its taking the full force of Israeli wrath in 2006 and surviving. While I think that this post suggesting that most Egyptians sympathize with Hizbullah is overstated (I suspect most Egyptians don't think about it very much), the Muslim Brotherhood's Supreme Guide has expressed similar sentiments, and there is a potential for alienating public opinion if the government keeps up the drumbeat. Hasan Nasrallah's defense of his agent was to insist that Hizbullah was only trying to provide arms to Gaza, and that is a popular cause in Egypt. The government, I think, may itself be guilty of overreach. "Believe Me, America Accepts All Our Decisions"
Avigdor Lieberman, in his first full-scale interview since becoming Israel's Foreign Minister, has said that the US will not put forth peace initiatives unless Israel agrees, and said, "Believe me, America accepts all our decisions." Professors Mearsheimer and Walt must be feeling vindicated right about now. Lieberman seems to be saying Israel is directing US policy on the Middle East. Whatever one may think of the power of the "Israel lobby," it is a rather undiplomatic boast to be coming from Israel's Foreign Minister. I suspect this quote will soon be all over the Arab press. It's too blatant to let pass without comment. The signals coming from Netanyahu and Lieberman on the one hand and from Obama, George Mitchell and Rahm Emanuel in recent days on the other suggest that the US and Israel are really talking past each other at the moment. None of this augurs well for progress on the Israeli-Palestinian track, or the more potentially explosive issue of a possible Israeli strike on Iran. And Lieberman's remark suggests a tendency to assume that the US will take its lead from Israel on Middle East policies. That may have been true at times, but the Obama Administration seems to be signalling that it's not true now. The White House has announced that President Obama will separately invite Binyamin Netanyahu, Husni Mubarak and Mahmud ‘Abbas to Washington soon, most likely prior to the first week in June. This clearly is yet another signal that the US wants to move forward on the Israeli-Palestinian track. It also comes after a game of diplomatic chicken in which Netanyahu planned to come to Washington for an AIPAC gathering in May, but then was "rethinking" the visit when the White House signaled Obama would be out of town at that time. By inviting Netanyahu when Obama finds it convenient, the White House may be signalling that it plans to control the timing of the meeting, not yield that timing to Israel. Since I believe the King of Jordan is already scheduled for a visit, the President should have multiple opportunities to familiarize himself with the issue. Over this past weekend, the New York Times ran a profile of Egypt's antiquities chief, Zahi Hawass. If you've watched any program about ancient Egypt lately on the History Channel, Discovery Channel, National Geographic Channel, or probably anywhere else, you'll be familiar with Dr. Zahi, the ubiquitous spokesman for Egyptian antiquities. For good or ill, and the Egyptology community seems divided on this, Hawass has transformed the image of Egyptian antiquities. An outgoing self-promoter who has adopted an Indiana Jones-style hat as his identifying marker, his exuberant extroversion has shaken the dust off archaeological exploration. Whether that is good for scholarship is for archaeologists to decide, but it has certainly been good for publicity, and that has doubtless spurred tourism and interest. Never a man to bask silently in the glow of what was generally a positive profile in the New York Times, Hawass promptly (dated the day before the publication date of the profile) posted a response on his website. He is certainly a showman. As it happens, some good friends of mine were acquainted with Hawass in his younger days, and I met him a time or two, never suspecting his future fame. When my nine year old daughter, an archaeology buff, was watching a Discovery Channel (I think) show about Hatshepsut a few months back, I casually mentioned that I'd known him slightly long ago. "You know Zahi Hawass! Why haven't you ever told me?" I explained that I never knew him well and he'd probably not remember me, but the fact that we'd crossed paths impressed her more than any of my professional accomplishments do. Because he is a celebrity, and I'm not sure there has been a real celebrity archaeologist since at least the days of Howard Carter of King Tut fame. Egypt has been a bit skittish about how to deal with Avigdor Lieberman as Foreign Minister of Israel, given the fact that Lieberman has in the past said some fairly outrageous things about Egypt, once urging the bombing of the Aswan High Dam. Foreign Minister Ahmad Abu'l-Gheit recently said he would not shake Lieberman's hand, and the question of how to deal with him has been in the air since his appointment. Now it appears that Omar Suleiman will be the first to meet with Lieberman. Suleiman, as intelligence chief, is a major intermediary with Israel, but he is in some sense less ceremonial and official than the Foreign Minister. But it may at least establish communication. I said something nice about Iranian President Mahmoud Ahmadinejad yesterday, when he urged that Roxana Saberi be released. That was then. His performance at the "Durban II" UN Conference on racism in Geneva is not in the same vein. European delgates walked out during his speech denouncing Israel, though some European countries (the Netherlands, Italy, Germany) have joined the US, Canada, and Australia (and Israel) in refusing to attend. Ahmadinejad is the only head of state attending, and is clearly using the opportunity to shore up his anti-Zionist credentials. Israel's policies towards Palestinians, and its occupation, are fair game for criticism, but when denunciations of Zionism reach the point of denying the state's very right to exist — and while Ahmadinejad may phrase his rhetoric so as to leave some room for debate about what he means, he certainly seems to be saying that — it raises some question about why the United Nations should provide a forum for denunciations of a member state of the organization, a member state created, in fact, under UN aegis. "Durban II" has become a propaganda sounding board rather than a real international conference. One particularly egregious aspect I had not picked up on until the past few days is that Durban II was scheduled to coincide with Israel's marking of Holocaust Remembrance Day. That coincidence, if it is a coincidence, has added to Israeli anger over the meeting. There is plenty to criticize about Israel's operations in Gaza early this year and its overall record of occupation, but how does this conference advance things towards amerlioration of that occupation or towards a just solution? It merely rubs salt into open wounds. Unless you're Egyptian or Sudanese, or have hung out in one of those countries, or are an Arab who's watched a lot of Egyptian movies, you may not know about the holiday celebrated today. Yet arguably it may be the oldest holiday celebrated anywhere, and its name may preserve an ancient Egyptian name. Sham al-Nassim is Arabic, and the words mean "smelling the air," or "smelling the breezes" if you prefer. Other than the specifically patriotic days, such as the National Day, Military Day, etc., it's the only Egyptian holiday celebrated with equal ardor by Muslims and Copts, and by Jews when Egypt's Jewish population was significant. For the past couple of thousand years, it has been celebrated on the Monday after Coptic Easter (which coincides with the general Eastern date for Easter), thus today. Like Easter itself, which in English at least combines a Christian feast central to Christian belief, but based on the date of Jewish Passover, with a Germanic word relating to fertility (compare "estrus"), Sham al-Nassim is a historical palimpsest, a syncretistic hodgepodge, that has — besides being a great spring holiday for Egyptians of all faiths or none — finally given me the rare opportunity to use "palimpsest," "syncretistic," and "hodgepodge" all in the same sentence. (Class, you may use your dictionaries.) The ancient Egyptian spring festival was first baptized by placing it on Coptic Easter Monday, then Islamized or at least Egyptized by being adopted as the spring holiday for everybody regardless of religion. I think the only other ancient Egyptian feast that survives in the Egyptian calendar today may be the Wafa' al-Nil in August, celebrating the Nile flood and also retaining elements of pagan, Christian and Muslim eras, but fading a bit I think since the end of the annual flood with the building of the Aswan High Dam. Possible Good News in Saberi Case? In keeping with my precedent of offering holiday greetings for feasts celebrated in the region, I would like to wish all my Eastern Christian readers (Orthodox, Copts, Armenians, Assyrians, Syrian Orthodox, etc.) a happy Easter under the Eastern calendar system. Easter is a particularly central and triumphant feast among the Eastern churches, and it falls this Sunday this year, a week after the Western date. An article about how more independent newspapers are being founded in Egypt even as they're shutting down elsewhere. As if they needed this on top of everything else: two strong earthquakes in Afghanistan's Nangarhar province. Lebanese Speaker Nabih Berri, a Shi‘ite and ally of Hizbullah, is denying reports he planned to visit Egypt to try to mediate between Husni Mubarak and Hizbullah. For your James Bond needs: Lebanon has been up in arms over the arrest of a former Internal Security Forces Brigadier General (identified only by his first name, Adib) on charges of spying for Israel. Now they say he kept his radio for communicating with Mossad in his mini-bar. Georgia and Russia are trading accusations again as NATO plans military exercises in Georgia next month. I hope President Saakashvili plays things a bit more cautiously than last year; I've always felt that Georgia did a bit too much bear-baiting last year and then was startled when the bear lashed out. "Iranian drone" Photo is Israeli? Iran may have been doing some photo tampering again, reminiscent of the "missile launch" photo last year that had clearly been Photoshopped. This time Press TV, the Iranian news agency, has apparently run a photo of a soon-to-be-unveiled "Iranian drone" that is actually an Israeli Heron, and the photo is identical to an Israel Aircraft Industries photo of the Heron. Since Iran has not unveiled its drone yet, and since some sort of Iranian unmanned aerial vehicle (UAV) has been detected operating over Iraq, it may just be that Press TV substituted a drone photo they had on hand for the still-secret Iranian one. But it still is rather ironic that they chose an Israeli one. This piece at Israel Policy Forum and the original article in Yediot are drawing attention, though the original article doesn't seem to be online yet; at least they don't have an English version up on their website yet and I haven't located a Hebrew one but my Hebrew is too poor to be confident I'm not missing it, but the gist, as summarized at the link, is that Rahm Emanuel told an unnamed Jewish organizer that President Obama is determined to bring about a two-state solution during his first term, and that Obama will be "out of town" when Netanyahu attends the AIPAC conference, the implication being that Netanyahu will be snubbed until he comes around. That Obama and Netanyahu have rather different visions of an Israeli-Palestinian settlement has been obvious for some time. Rahm Emanuel — whose father fought with the Irgun — may be the one senior Administration figure who could get away with this kind of toughness without being accused of anti-Israeli bias or worse, but it also is unusual for a White House Chief of Staff to be sending diplomatic messages. Taking Action Against Piracy on the Somali Coast. Vice Admiral Kevin J. Cosgriff, until recently the commander of NAVCENT, addressed the piracy question yesterday. David Kilcullen, author of The Accidental Guerrilla: Fighting Small Wars in the Midst of a Big One, and a counterinsurgency expert for General Petraeus, spoke last week. Both are worth attention, I think. Since hits on our MEI website vastly outnumber hits on this blog, I haven't been repeating stuff from the website, but as the blog readership grows, perhaps there will be few readers following links here who don't know our website, so let me plug some of our in-house stuff a bit more often. Especially after the fact, like these podcasts, for those readers who aren't in the DC area. Al-Shurouq al-Jadid is reporting that four Iranian Revolutionary Guards were arrested in Egypt in December. For those who don't read Arabic, The Arabist has a summary. And now, there are reports that the group under arrest includes two members of Fatah who were trained in Sudan and Libya; the English version of this Al-Masry al-Youm story is here. Here's an Economist Intelligence Unit assessment. Israel is now using Hasan Nasrallah's image in an anti-drug campaign. A bit odd but not completely, since Hizbullah controls Baalbek and other areas in Lebanon's richest hashish-producing lands. Egypt is expanding its propaganda campaign from targeting Hizbullah to including Iran as well. Unrelated to the Egyptian claims as such, here's an interesting post on Hizbullah's electoral strategy in Lebanon, called "The Age of Nasrallah," by the blogger who calls himself (or herself?) "Qifa Nabki," a Harvard Ph.D. candidate based in Lebanon. (For those who don't know Arabic, Qifa Nabki are the first two words of what is perhaps the single most famous classical Arabic poem, the Mu‘allaqa of Imru'l-Qays, and mean, roughly, "Stop and weep.") It's an interesting blog. We are clearly witnessing an Egyptian full court press of propaganda here, whether or not all these allegations have a foundation. Egypt is going out of its way to attack Hizbullah and Iran and, now, maybe Libya and Sudan are going to be implicated as well. The other day I wrote a post defending Thomas Hegghammer against some criticism of his work on jihadi Islam. At the time I did the defense I based it on my own familiarity with Hegghammer's work, not with the specific Times Literary Supplement article for which he was attacked. Having read both his original TLS article, and the FrontPage article attacking him, I refer you to both of these articles. Did the FrontPage author, David Solway, even read Hegghammer? It doesn't seem to me like he's talking about the same article I read. Has the Islamophobic right become so intolerant they don't even recognize serious intelligence analysis when they see it? So let me plug the Jihadica site once more. I am not a knee-jerk liberal or a knee-jerk anything, but if this FrontPage article is the best the right can do, it's not very good. It argues against sound intelligence collection and assessment. That's precisely what produces Pearl Harbors and 9/11s. Do You Have any Old Singer Sewing Machines? In Dhulum, it was reported that people had broken into two tailors' shops to steal the machines. In the city of Madina, people were holding mobile phones up to the machines, due to the belief that they could be used to detect the presence of red mercury. The picture of the old Singer in the BBC story looks like one my mother had about 50 years ago in Missouri. Should I have held on to it? Well, of course, there are a couple of issues here. First of all, this is a classic urban legend, the sort that spreads rapidly in the age of E-mail and instant messaging and texting and Twitter, and no one in their right mind would, or at least should pay $50,000 for an old sewing machine. Similar stuff runs the rumor rounds in the US and Europe so we shouldn't feel superior to some Saudis for biting. (I have a really interesting business prospect involving the widow of a former Nigerian general . . . Well, somebody must be biting.) And clearly the Saudi government is debunking the story. My old newsletter The Estimate (some articles online free at this inactive old website) used to have a "Coffeehouse Gossip" column to track the wilder rumors and speculation that is pretty common in the Middle East, especially among the denizens of the coffeehouses. I hereby create a new "coffeehouse gossip" category on this blog, for just this sort of story. Did Mossad Help Tip off Egypt? This story in Haaretz is headlined, "Mossad tip led to capture of Hezbollah cell in Sinai," though a careful reading of the story (by Yossi Melman, Amos Harel and Avi Issacharoff) says that foreign intelligence sources including Mossad and the CIA helped tip off the Egyptians to the Hizbullah operation that's causing so much of a flap in Egypt just now. Later in the story British MI6 and the German BND, and even Jordanian and Saudi intelligence receive mentions. At least in the Haaretz story, but also in some of the news coming out of Egypt, there are hints that the operation is part of a new Hizbullah overseas reach in response to the assassination of Imad Mughniyya. This story also raises a new possibility, citing unnamed Egyptian sources as stating that the Suez Canal was also a possible target of the group. Attacks on Israeli and Western tourists in Sinai are a sensitive enough issue for Cairo, since tourist revenue is critical and the "Sinai Riviera" around Sharm al-Sheikh is popular with Israeli tourists. But the Canal is Egypt's lifeblood. Is is not much wider than many big ships, and after both the 1956 war and the long closure from 1967 until after the Sinai I agreement, significant clearing operations were necessary before it could resume traffic. Sinking one ship in the Canal would cripple Egyptian revenues. Now, however, it's the circus clowns who are on strike. Arabic story here, English version and a photo at the earlier link. One of the things they're protesting is privatization. I had not realized that the circus was state-run. It must be a legacy from the Nasser era when everything was being nationalized. And apparently they want to keep it that way. Open feuding between Egypt and Hizbullah has been escalating since Friday, when Hizbullah Secretary-General Hasan Nasrullah openly acknowledged that one of the people arrested by Egypt last week is indeed a Hizbullah agent, while denying that Hizbullah intended to act inside Egypt. Hizbullah always denies carrying out operations outside Lebanon, except those aimed at Israel; he insisted that the agent was in Sinai to help smuggle arms into Gaza, not to strike at Egyptian interests. This has sparked strong reactions in the Egyptian media and leadership, since it is being seen as flouting Egyptian sovereignty. Admittedly this report of the investigations to date does suggest that the plot was aimed at smuggling arms to Gaza, but Egypt is protesting a violation of its sovereignty. Part of the surprise here — actually a clever tactical move — is that Nasrullah did not offer the usual flat denial of involvement, but portrayed Hizbullah as trying to relieve the siege of Gaza, thus reminding the world that Egypt's keeping the Rafah crossing closed is as much responsible for Gaza's suffering as Israel's closure of the other crossings. Popular opinion inside Egypt has generally been critical of the government's policies on Gaza, and Hizbullah is playing to that. Of course, there's a certain disingenuousness to Hizbullah claiming it does not carry out operations in other countries and admitting that it had agents operating in Sinai. But by ratioalizing their presence rather than denying it, Nasrullah subtly shifts the debate from one of violating Egyptian sovereignty to one of spotlighting Egypt's keeping Rafah closed. And Nasrullah has also won some support from Mahdi ‘Akef, the Supreme Guide of the Muslim Brotherhood, who has denounced the Egyptian media campaign. Egypt is also saying that the Hizbullah plotters were planning to attack Israeli tourists in Sinai, and in fact, an Israeli tourist has received stab wounds on a visit to Sinai as if to verify the claim; Egypt is also said to be looking for 13 more plotters in Sinai. Husni Mubarak has proclaimed that Egypt will defend its borders and its sovereignty. At this point Egypt is evoking the traditional Egyptian protective reaction to perceived incursions on its sovereignty , a sensitivity dating to resentment of British colonial interference. Nasrullah, on the other hand, is playing an entirely different hand, even a different game, in trying to shift the debate from his agents being caught to the question of Gaza and Egypt's role in its ongoing siege. Who wins this clash of narratives remains to be seen, but by directly challenging Egypt, Hizbullah seems to be reaching beyond its usual area of operations. Whether this is an overreach, though, remains to be seen. As we wrap up my daughter's birthday and shift into Easter weekend I'll be quiet for a couple of days, unless something major happens. As I've done for other religious holidays associated with our region, let me wish every reader who celebrates Easter (on the Western calendar) a Happy Easter. I'll do the same next week for the Eastern date. "To fight Iranian subversion in Egypt, Cairo is willing to help Israel prevent the arming of Hamas in the Gaza Strip." That's from Haaretz, as the drumbeats continue about this Egyptian claim of breaking a Hizbullah-backed network planning to operate in Sinai. There's still a lot of uncertainty about this Egypt/Hizbullah thing. The Arabist had some thoughts along the same line as mine, that the whole "spreading Shi‘ism in Egypt" theme is more a case of Sunni insecurity than actual intent. That doesn't mean that Hizbullah's not involved, of course, just that I don't think the motive is sectarian so much as ideological. 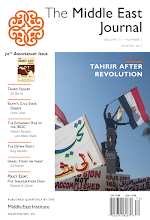 A new issue of the Carnegie Endowment's Arab Reform Bulletin is out. It's always got good material on democratization and reform issues in the Arab world. Pieces this time on Palestine, Egypt, Syria, Bahrain and Western Sahara. It's currently edited by Michele Dunne, who's no relation and spells Dunn with an (unnecessary) extra "e", but I have gotten phone calls intended for her: Michael Dunn/Michele Dunne look similar in the Rolodex, and we only work about a block apart anyway. We're also both Egypt hands. And Michele's heard me make all these comments before, so I hope she won't mind. Al-Masry al-Youm is runnng the whole Ayman Nour divorce story into the ground. As near as I can tell from this "interview" with Gamila Isma‘il (soon to be ex-Madame Nour) they seem to have been walking on the streets in downtown Cairo asking her these questions. National Enquirer style journalism indeed: it sounds a bit like stalking. Arabic story here; English here. Breaking the story on April 6, when Nour was trying to regain the center of attention, may have been justifiable, but at this point it's descending into voyeurism. (Not that Western tabloids are any better, but this is supposed to be an elite paper, the independent equivalent of Al-Ahram.) The Arabist says that "I don’t think I can take much more of the smug, self-congratulatory tone of al-Masri al-Youm anymore," notes their over-hyping of their own stories (and claiming credit for the Hizbullah story, which was publicized by the government) and says "I officially declare the al-Masri al-Youm era of Egyptian journalism over. Not sure what the new era is, but they no longer have the same authority they once did." I think he's right on target there. I also suspect that since the official government press is so staid and boring, even the "elite" independent papers are seeking to be a little sensational to gain a following. Leave these folks alone now. The initial story was news because they are national figures; but from here on, let 'em be. It's stale news now from yesterday, but Jeffrey Feltman will be the new Assistant Secretary of State for Near East Affairs. Here's his biography; he's already made headlines as Acting Assistant Secretary by going to Syria. The 6 April Egyptian Strike: a Fizzle?